An experimental propulsion system that seems to violate the laws of physics may actually work, a new study suggests. 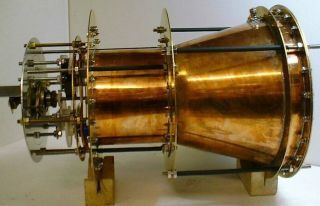 A controversial and puzzling engine design known as the EmDrive generated small amounts of thrust in a lab test, NASA researchers reported in the study, which has yet to be published or peer-reviewed but was recently leaked online. But the NASA team, led by Harold "Sonny" White of the agency's Johnson Space Center in Houston, did measure some thrust. Specifically, their EmDrive variant produced about 1.2 millinewtons of force per kilowatt of energy. That's about 100 times more thrust than solar-sailing spacecraft, which harness the momentum of photons streaming from the sun, are able to achieve, White and his colleagues wrote. Like solar sails, the EmDrive requires no propellant; a spacecraft equipped with this propulsion system could generate all the microwaves it needs using solar panels. So the EmDrive could make space travel much cheaper and faster, theoretically opening up the heavens to greater exploration, advocates have said.